Last year Facebook started testing out an interesting new feature called 'Find Wi-Fi'. It was only available in a "handful of countries", but the premise was enticing - it allowed you to find all the wi-fi sources in the surrounding area. If you're caught in a pinch with bad signal or limited data, this could be immensely useful. Facebook are now launching the feature globally. It will now be accessible from the 'More' tab in the mobile app. Only businesses which state that they offer free wi-fi will show up on the map, but the feature will also detail information about those businesses, such as opening times. Not that many businesses currently post their wi-fi availability on Facebook, so there will probably be an adjustment period. While there are already a few standalone apps which offer this service, Facebook have a wider database to draw from, and they're saving people the trouble of downloading anything new. It's also a great way for businesses to promote themselves in real time. If people are scoping for a wi-fi source and there's a wide range of options available, they'll start considering other factors, like what kind of business it is, if it serves food and drink, and the general vibe. 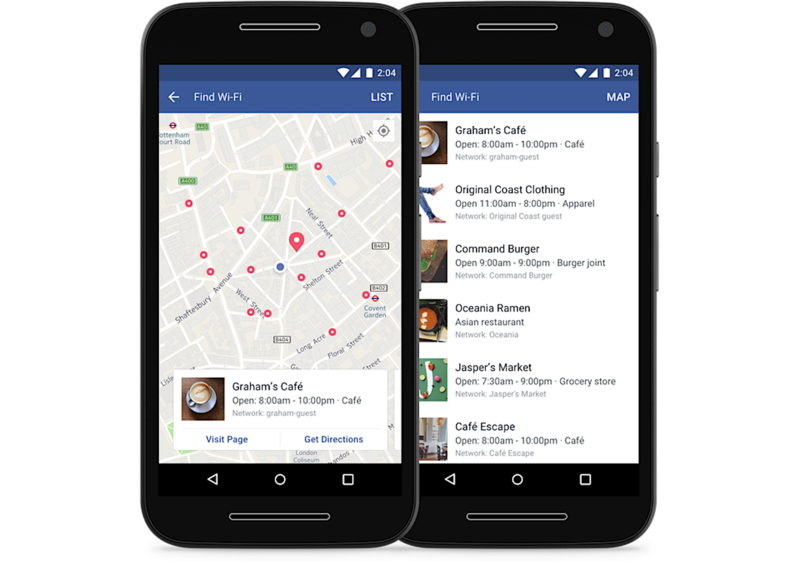 Having a well put together Facebook page with a registered wi-fi could be a real revenue booster once this feature starts gaining ground. From the users' point of view, this is especially useful for travelling, something which Facebook have focuses their mobile development on quite heavily recently. Of course, it's worth bearing in mind that using free wi-fi abroad, or even locally carries a certain amount of risk. Studies have suggested that free wi-fi services in cafes and bars are among some of the most insecure around. Even with that in mind though, this is one of the most useful features Facebook have introduced of late.